1995 on The Wheelhouse is home to Patrick and Sheila Uden and their children, Frank and Dorothy. Work continued apace on the interior and garden until 1999 to complete the restoration, making a house to be proud of. View from the North across the dam. The Wheel House is on the right and The Mill House is on the left. A distant view across the dam. The Wheel House is on the right. The Wheel House prior to the commencement of a meticulous programme of restoration. The picture dates from 1985. I have been told that the hamlet of Nutbourne once centred on the mill and it wasn't until the coming of train services from London to Pulborough that brick houses - including the expansion of Nutbourne Manor - started to be constructed in density along The Street. This makes sense. Mill House, The Wheel House, The Old Manor House, and other cottages line up to create a rough east-west village, rather than the later north-south one (Presumably the track running west from the mill and curving right at The Old Manor to continue upwards north-west beside the sunken tree-lined walk towards the fields, is the old 'high street'). This change of orientation coincided with the slow decline of local bakeries from 1918 until the arrival of steam-ovened white sliced bread in the late 1940s. Legend has it that the miller and baker of Nutbourne, depressed at the prospects for his business and the price pressure on his bread sold from the ex-grain store at Mill House, killed himself by tying a millstone round his neck and jumping into the pond. Apparently the mill's overshoot wheel had been removed much earlier in 1939, turning the Mill House complex into a bakery only. Whatever the truth, by 1960 the mill was derelict and used as a rough storehouse for farm implements. 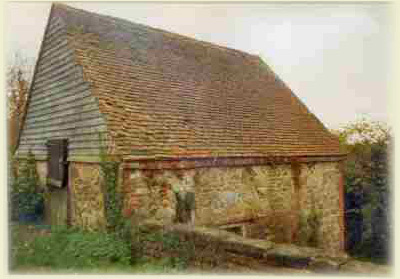 It remained in this condition until the late 1970s. The mill, now The Wheel House, first came to my attention as a sale card in an estate agent's window in Arundel. 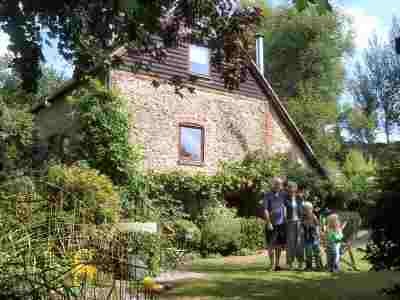 Called The Old Watermill, it was on sale at £150,000. The picture showed an apparently well constructed conversion with ham fisted 'cottage' details like 'stable doors' with fake bottle glass whirls in their windows. Horrible! With little else to do on a wet and gloomy Sunday afternoon I drove back to London via Nutbourne to find it. It looked grim indeed. Abandoned cars, mud, condensation on the windows, a weed filled garden and lashing rain made it look undesirable indeed. Only its quirky position snuggled up against the dam wall had any charm. That was November 1989. In April the following year I was in West Sussex again. I decided to have another look at The Old Watermill on my way back to London. This time it was a bright Spring Sunday. Daffodils and primroses carpeted the grass. Even the wrecked cars and scruffy garden seemed happier. The following Monday morning I telephoned the agent in Arundel. It was still for sale so I casually offered £140,000. They snapped at it. A long and convoluted negotiation got underway revealing why no one had bought the little house. The chap selling had done the conversion himself, driving his neighbours, Sir Francis and Lady Avery Jones, almost apoplectic in the process. He and his wife had started the conversion together, but now they had split up. The money had run out. His girlfriend now lived - or should that be camped? - in it, but with heating by inadequate wood-burning stove, bottled calor gas and gimcrack plumbing, life wasn't much fun. The entire shambles was further complicated by a complete lack of paperwork on the vendor's side. After more than a year of frustrating stop-go talks I finally agreed to buy the place, pretty much on trust. In 1992 I started work renovating it and, at Sir Francis Avery Jones' suggestion, renamed it 'The Wheel House' (Apparently the unofficial moniker it carried in the 19th Century). First the garden, then the flooring, then the doors, then the plumbing, then the heating - on and on it went until in 1994 I felt it was finished enough to be lived in. I had spent high, everything top quality: hardwood doors, Portuguese terracotta floors, antique Victorian door furniture, Italian reproduction 'thirties bathroom fittings, a power-shower, cedarwood blinds, French cooker and kitchen taps, American kitchen sink, etc. I used brass screws throughout, no cross-heads and no steel screws except where the heads didn't show. All the shelves were made by me from reclaimed pub table pitch pine. The interior wall colours were taken from French and Italian house exteriors I had photographed and filed. I restored some antique light switches and retro-fitted these to the downstairs and first floor rooms. All materials were either natural, new-distressed or original. A new wood burning stove was installed and bricked-in to the corner of the downstairs lounge. The bigger fire needed a wider steel chimney. This was done. Against all odds I managed to get gas run from the main, down the track, as far as Mill House. In the winter of 1993 central heating was installed and for the first time in its existence the house became warm and inviting. All this time I was re-creating the small garden. I had new fencing made and finally rolled an old but unused mill stone, buried in the garden, up onto a plinth to use as a garden table. I had steel railings made for the mill race and the garden steps and front door steps. The latter were based on the design of the railings outside The Rising Sun pub. The Wheel House turned out to be an idyllic spot. It is south facing on a south facing slope. The dam wall made a sun-trap that warmed up the entire garden, yet being low the earth remained damp and cool all summer. From 1995 until 1999 I improved the house and its garden every weekend. In the winter of 2000 weeks of exceptional rain filled the neglected drainage ditches round the vineyard fields. They overflowed and the water swept down the track and through The Wheel House garden. After an hour the garden became saturated and the fast-flowing water spilled over into the well of the kitchen steps. Within seconds it was three inches deep on the ground floor of the house. My neighbours in Mill House and Nutbourne Manor tried in vain to stem the flow while I drove through swirling rain and smashed trees from London to Nutbourne. I arrived at 06:00hrs - it was dark, wet and windy. Remarkably, I managed to get all the water out of the house by mid-afternoon and it was dry three weeks later. Luckily, a few weeks earlier I had taken pre-emptive action on the mill pond itself by removing a layer of bricks from the pond outflow, thus lowering its level. 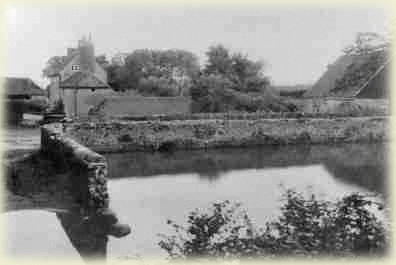 It prevented the catastrophic flooding of the 1950s, reported by Sir Francis Avery Jones, when the pond washed over the wall and through Mill House. What the 2000 flooding experience revealed was how interdependent we all were on the good management of the land. The simple neglect of ditches half a kilometre from the house caused chaos. In fact, I had discovered on my arrival in Nutbourne in 1992 that the mill pond outflow was completely blocked with brushwood and weeds. Only dry years had prevented flooding. 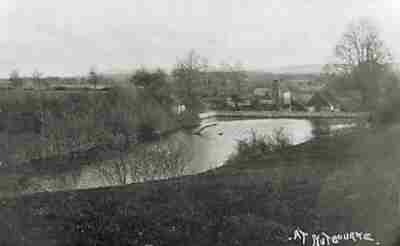 The brushwood had come from further upstream on land owned by Ropers Farm. Another example of cause and effect - the interlocking nature of life in a place like Nutbourne. In fact the entire lakes-pond-mill-dam-ditch-track complex around Nutbourne should really be seen as a total water management system. It is more like one huge, ancient machine designed to funnel power into the task of grinding grain. It is neglected at everyone's peril - and aesthetic decline. Nutbourne, and the location of The Wheel House, is a sort of parallel universe. It has a unique character that feels more like a pre-WW2 picture of Britain rather than a place in the new millennium. It is a sort of secret corner. A place of no roads, rich in wildlife and hedgerow fruits. But it needs protecting. Selfish over-development and excessive manicuring of the countryside (as opposed to intelligent management of the ancient infrastructure) will kill its charm. The careful restoration of The Wheel House was my small contribution to Nutbourne's future.